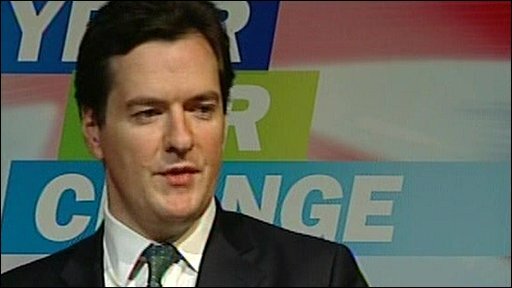 Shadow chancellor George Osborne has said he wants a "more solid" economy for Britain built on savings, enterprise and exports. He said the economy under Gordon Brown was "severely unbalanced" and growth driven by "public and private debt". Easyjet founder Stelios Haji-Ioannou is among those backing a new Tory economic model, the shadow chancellor said. Meanwhile Mr Brown has denied the claim that Labour plans for the economy were not clear enough for the City. He told the liaison committee of senior backbench MPs the four year deficit reduction plan had clarity and said the government had been "right to have run a large deficit... I think it has been essential for us to have the recovery that is necessary for the economy". Earlier, in a speech at the British Museum, Mr Osborne said the Tories would seek to protect Britain's credit rating and "eliminate a large part" of the £178bn budget deficit over the next Parliament - which he said went further than Labour's pledge to halve it in four years. He said the pace of "fiscal tightening" had to be done in co-ordination with the Bank of England and said Labour's plans to halve the deficit in four years was "not regarded as credible". He also said a Conservative government would seek higher exports, business investment and savings as a share of Britain's GDP. Mr Osborne began his speech at the British Museum by saying the "old" economic model was built on "shaky foundations" of a public spending boom, an "overblown" banking sector, and consumer borrowing based on a house price "bubble" - and said new sources of growth were needed. The Conservatives would "rebuild" the economy on "more solid foundations" he pledged. He said: "Borrowing from China so that we can buy the goods they make for us may be Gordon Brown's idea of our future but it is not the Conservative Party's. We want Britain to be selling to China and the rest of the world." He said new sources of growth were needed - supported by a competitive tax system and new infrastructure - like high speed rail and broadband. On cuts, the shadow chancellor said the Conservatives would "make a start" in 2010 - and did not elaborate on immediate spending cuts to be implemented in a post-election budget, which the Tories say would be held within 50 days of a general election. Setting out eight economic "benchmarks" by which a Conservative government could be judged - he said Britain's credit rating was "under threat" of being downgraded - which would mean higher interest rates on national debt and throughout the economy. Other benchmarks included raising the private sector's share of the economy in all regions, creating a "safer banking system", reducing youth unemployment and carbon emissions and increasing the UK's share of the global market in green technology. Mr Osborne said the crossbench peer Lord Stern, who wrote a key climate change report for Labour, had "agreed to advise us on the creation of this green investment bank". But amid reports suggested he had been "poached" by the Tories, Lord Stern issued a statement saying: "I would be willing speak to the Conservatives' advisory group about their ideas for a green investment bank, just as I am continuing to contribute to discussions with the Labour government about policies on climate change. "I should stress that I am not, and have no plans to be, an adviser to any political party." Climate Secretary Ed Miliband told the BBC that Mr Osborne's economic policy was "increasingly farcical" adding that "within minutes" of Mr Osborne's speech it had started "to unravel" and accused the shadow chancellor of not saying how quickly he would cut the deficit and how much he would spend if the Tories won power. He said Labour had "clear spending plans" for next year which were key to sustaining the recovery. And Vince Cable, for the Liberal Democrats, said the Tories had changed their economic policy three times in as many weeks. "We all want to see a stable, growing economy. The question is how we get there, and on this the Tories have no answers," he said. Mr Osborne also read out a list of leading business figures who he said had not publicly endorsed the Conservatives before but who "already think that this new economic model represents Britain's future". They were Easyjet founder Stelios Haji-Ioannou, Virgin chief executive Stephen Murphy, Kingfisher chief executive Ian Cheshire, GlaxoSmithKline chief executive Andrew Wittey, Diageo chief executive Paul Walsh, Autonomy chief Mike Lynch and Mick Davis, chief executive of Xstrata. Miles Templeman, director general of the Institute of Directors, said Mr Osborne had set out the "right aspirations" but more details were needed "particularly in relation to cutting the deficit". With the public spending deficit expected to grow to £178bn this year, it is set to be one of the key battlegrounds at the coming general election. The economy came out of recession during the final quarter of 2009, but at a lower than expected rate of growth of 0.1%.